The TerraTrike Rover Tandem uses the modular design of the excellent Rover trike to create an affordable, friendly and transportable tandem trike. The Rover Tandem is not a separate trike in itself, but an accessory added to a Rover to add an extra seat. This is a further development of the Rover’s modular design paired with its unique vision, getting couples and friends riding together. If you have a rider who is always struggling to keep up, getting on a tandem is a great equalizer, letting the faster rider share power with the slower one. The tandem attachment comes with either a standard drivetrain or an Independent Pedaling System, which allows either rider to coast without affecting the other rider. A standard drivetrain is much more efficient and in general we’d recommend it, but there are some cases where independent coasting is a great advantage. It takes about 15 minutes to convert from single to tandem or back into a single. This work isn’t as trivial as disassembly as you will probably need to re-size a chain. When you get a Rover Tandem from us we’d be happy to help set it up so this work is quicker and requires fewer tools. Most Rovers we sell have the NuVinci n330 CVP transmission. On the tandem, we’d recommend changing this for a Shimano Alfine-11 hub for two reasons. One is that tandems often need a wider range of gears than the n330 provides. You can expand that range and still get the great feel of the CVP by changing to an n380, but another problem with CVP’s in this application has to do with how the cables hook up from the shifter to the hub. If you set up a Rover Tandem with a CVP you will not be able to convert it easily between single and tandem. (It is easier to show you why this is than explain it.) If you plan to use the tandem only as a tandem then there is no problem. The last, more sticky problem is that the n330 and n380 hubs are not rated for tandem use. This doesn’t mean you can’t use them, but you’d better go easy on it. Some riders can’t do anything except go easy, but not all. Overall, we recommend the Alfine-11 for this application. When we talk about tandems, there are a few terms to know. The front rider is called the “captain” and the rear rider is called the “stoker.” There are two separate chains. The one running from the captain’s crankset to stoker’s is called the “timing chain.” The rear chain, running from the stoker’s cranks to the rear wheel is called the “drive chain.” The stoker does nothing but pedal. They don’t steer or shift or brake. They just take photos and wave at people. Some tandems have the stoker working a shifter or a drag brake (for speed control on long descents), but the Rover Tandem is much more simple. 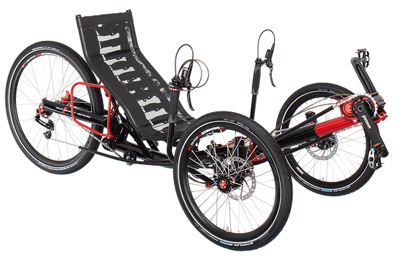 Our price: $1099 for the Rover Tandem Attachment, $1399 for the Independent Pedaling System Rover Tandem Attachment. Alfine-11 Rover tandems are about $3000-3300, depending on IPS. The Rover Tandem Kit quickly transforms your standard Rover into a Tricycle-built-for-two! 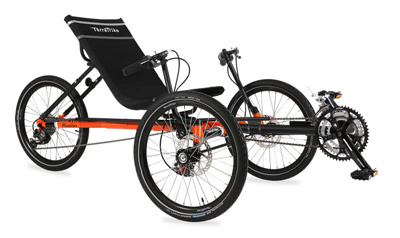 Simply disconnect the rear section of your trike and add the new tandem frame extension in the middle, new included front chains and chain tubes, add the seat and handlebars and you are ready to ride! The stoker seat features the same adjustable quick release as the original Rover seat and allows for a wide range of rider sizes. We’ve also included additional chains and chain tubes for the Tandem so you can quickly change from the Tandem to the single rider version without having to add or subtract a chain. In truth you should probably upgrade the wheels to double wall and the tires to Schwalbe Big Apples. We don’t know for sure, but we know this turns quite tight for a tandem trike. Most tandem trikes steer like the federal government. This gives you the gearing range of a basic 21-speed bike.